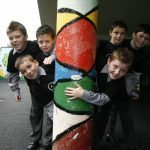 The biggest consultation that has taken place with in children and young people in Ireland. The Big Ballot is the biggest consultation that has taken place with in children and young people in Ireland. 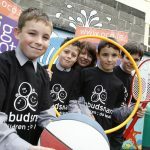 With the Ombudsman for Children’s Office newly created in 2004, this consultation aimed to give children and young people in Ireland a chance to have their say and to vote on issues that matter most to them. Education materials were developed for schools and youth groups to help them. Almost 75,000 children and young people in over 500 schools and education centres took part in the Big Ballot vote. Each person had to vote on what mattered most to them – Education/Having a Voice/Play and Recreation/Family and Care and Health, Wealth and Material Well-being. Emily Logan, the Ombudsman for Children at that time, visited 30 schools across the country in a Big Ballot bus, to hear directly from children and young people how they were finding the Big Ballot process. On Universal Children’s Day (November 20th), children and young people were invited to Dublin City Hall to hear the results of the Big Ballot. What did we do after the consultation? We wrote to each school that took part and explained what the results of the Big Ballot were. We also asked for feedback to hear if the education materials worked well. We committed to working on issues of Family and Care over the following years.